Reviews: Novation Circuit Mono Station, Korg NanoKontrol Studio & NanoKey Studio, Mojave MA-1000, Arturia AudioFuse, Barefoot Footprint 01, Soundcraft Ui24R, iZotope RX6. 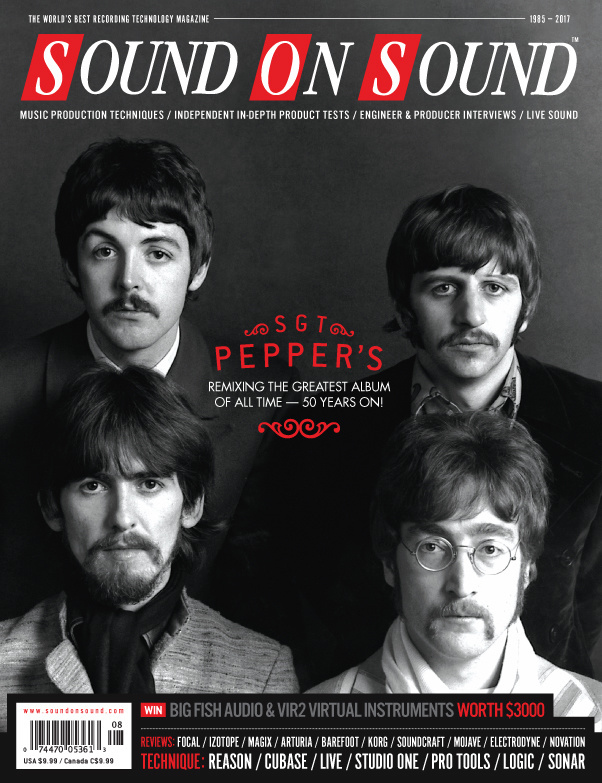 Features: Inside Track: The Beatles, Sgt. Pepper’s Lonely Hearts Club Band, Mixing Brian Wilson Live, Ariel Rechtshaid. Technique: The Sampled Orchestra: Part 2, Library Music: Part 4, Session Notes: Recording Classical Vocal & Piano Ensemble. Accusonus’ innovative sampling instrument goes way beyond conventional slicing and dicing, to extract individual drum hits from loops. Bringing the 099 to market took 15 years of ingenuity and application — and the result offers far more than a typical Fairchild clone. Arturia’s first foray into the world of audio interfaces squeezes a huge amount of connectivity into a compact desktop box. The Footprint 01 is Barefoot’s most affordable monitor yet. Does it give away much in terms of performance? In designing the Blurst, Electro-Harmonix have essentially built a synth-style resonant, fourth-order, low-pass filter and put it into a guitar/bass pedal. Electro-Harmonix’s Canyon is a delay/looper, but it goes the extra mile, packing a wide repertoire of delay effects into its compact pedal format. The latest product to bear the Electrodyne name combines classic ‘70s console summing with modern connectivity for use with DAWs. This is most certainly not just another orchestral string library. Indeed, what’s perhaps most impressive with Dronar is just how far the playback engine can take its original sample source and in how many directions. Another seriously compact offering from Belgium, Logica Gater, is a combined logic and gate module. Mojave’s latest mic combines the vintage tone of Telefunken’s classic ELA-M 251 with modern, low-noise performance. Boasting an array of unusual and impressive features, this British high-quality channel strip really stands out from the crowd. Subtitled ‘the other film orchestra’, the focus is once again on the jazzy film and TV scores of the ’60s, epitomised by the likes of Mancini, Schifrin, Barry and Goldsmith. Does this Polish plug-in capture the character of an American classic? Soma Laboratory’s Lyra-8 may force you to reconsider everything you think you know about synthesizers. Serbian company Sonic Dune have augmented the classic Neve 1073 design to offer the user both practical and tonal options. The latest release in the series is Twelve String Electric, which conjures the sound of late-’60s pop like almost no other instrument. UJAM expand their virtual guitar repertoire with two new instruments. Subtitled ‘essential tuned percussion’, this Kontakt-hosted collection of instruments offers Marimba, Xylophone, Glockenspiel, Tubular Bells, Glass Marimba, Song Bells, Vibraphone and Crotales. Re-sculpt your bass guitar recordings with DI simulation, insert effects and part doubling in Logic Pro X. The Beatles’ iconic Sgt. Pepper’s album was mixed twice on its original release. So why mix it again, 50 years on? We look at how to tame unruly instruments in Ableton Live. A list of all articles that hold associated media files for August 2017 audio examples. How do you go about translating one of the most iconic studio albums of all time to the stage? We speak to FOH engineer/production manager Clint Boire about the 50th-anniversary tour of the Beach Boys’ Pet Sounds. We serve up a tempting menu of little-known Pro Tools tips, including some new features in 12.6. Stretch, shrink and manipulate MIDI data with Sonar’s new Transform tool. It is time that we developed a new series of universally recognised credits that better reflect the skill and effort required to create a modern album. This month: Julia Michaels • Luis Fonsi feat. Daddy Yankee & Justin Bieber • DJ Khaled • Future • Classic Mix: The Monkees ‘I’m A Believer' (1967). How can you ensure that your library music hits the spot? What better way to find out than to ask the people who buy it! When people are paying peanuts, they’ll treat you like a monkey. Mothballed for over three decades and reopened two years ago, Valentine is a time capsule of awe-inspiring completeness, providing us with a clear window into a great era of record-making. Media content for the August 2017 issue.